with Max's current booming attitude vocabulary, it's prime time to inject some Filipino culture into the little man. Unfortunately, i have small amount of Tagalog speaking friends on frequent queue and although I can understand tagalog, I think in English and am a pathetic tagalog speaker. Ay Naku! Fortunately, I discovered that the Vancouver Public Library has a fantastic range of bilingual children's books! Unfortunately, the online catalogue is far from appealing so we have to trek on over and see the books for ourselves for the appeal and age appropriateness factor. All in a day's work! I love this book! there aren't more than 5 words in each page, but the scant amount are all you need to get the point across. We laugh out loud every time we read this book! The words in the book I already know and have been on high frequency since about Max was 2 years old. Max relates to "Bot Bot" in age now, and all the trouble he gets into. Perfect book for toddlers and beginner adults. a small step up from from a basic bilingual alphabet book. Illustrations are basic, and Max gets a kick out of the Tadpole page because it looks funny. there are not so common words in the book, some deep Tagalog that I could never get to stick in my head! However, I've also learned quite a few new words and also reinforced some words I've been hearing all my life. This book comes in various languages! 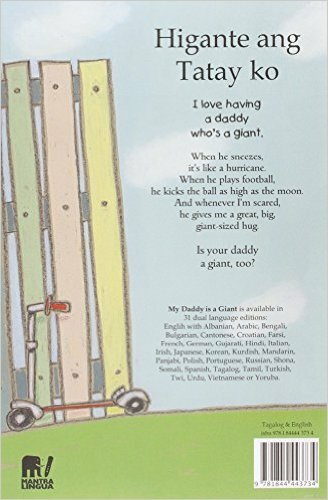 this is an endearing book about why a boy loves his daddy. I like that I can read a paragraph in english and then re-read it in tagalog. Again, I learned a lot! i would also classify the language level as much easier than book #2, with an ease in flow as I speak. Like the previous book, this story comes in many other translated languages. sometimes i want to just buy all these books so i always have a point of reference for words, but as a person who doesn't own a money tree, thank goodness for low demand and easy online renewing c/o VPL.ca! Off to the library for more books! I think you might just be unsure how to use the catalog! If you type in Tagalog - juvenile fiction it brings up numerous materials. hello! yes i've done that, however the catalogue doesn't provide pictures to go with the book. not a big deal really, easier to choose in real life as I can flip through the books. thanks for commenting!